3 Hours of brown noise combined with alpha and beta wave isochronic tones. Designed to help block out distraction, while helping you to memorize information and stay focused. A 3-hour brown noise track combined with alpha and beta wave isochronic tones. Brown noise can be used to help mask out distracting noises, which is why it's commonly used by students while studying, especially in noisy environments. 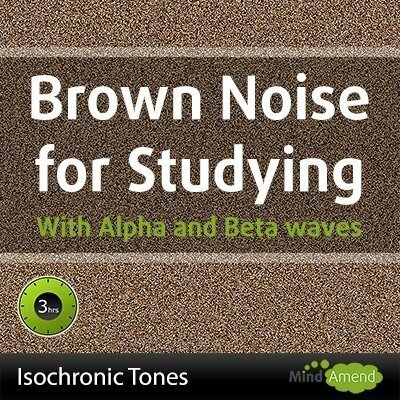 Taking brown noise a step further as a study aid, I've combined it with isochronic tones. 10Hz Alpha wave isochronic tones, which have been associated with improving memorization. 12-13Hz isochronic tones in the beta range, to help keep you focused. This is a brainwave entrainment audio session. The isochronic tones are the repetitive beats you can hear on top of the brown noise throughout the track. If this is a new concept for you, read my article on how isochronic tones work.